It would be easy to understand if the voice that greeted you on the phone would be tinged with disappointment. Yet, despite being on the sidelines since mid-February, Anaheim’s second-leading goal scorer sounds optimistic as he nears a return to game action. Despite his absence from the lineup, the 26-year-old forward has made his presence known in 2014-15. He already has reached an NHL-career best with 21 goals, including eight game-winning markers, ranking him second in that category. Seeing the Ducks duking it out for top spot in the Western Conference has certainly buoyed Beleskey’s spirits. Aside from the rest and readying himself for a return, Beleskey has turned to one of his favourite hobbies to combat the tedium of not playing. His top priority, however, is in replicating the same standard of play he set once he returns to the fold. It’s a formula that’s paid off handsomely for Beleskey and the Ducks. As for a possible musical career, or an appearance on America’s Got Talent, that will have to be put on hold for a while. Matt Beleskey doesn’t like to lose, whether it’s a tough end to a season or being on the losing end of a fishing trip with his dad. 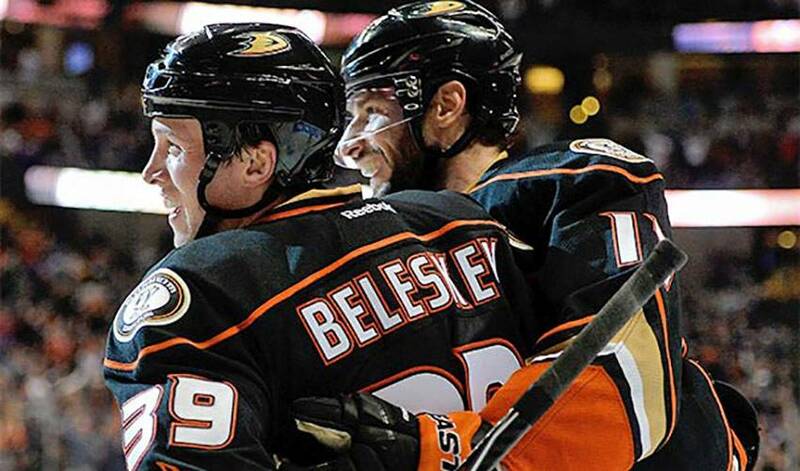 As the season draws near, Beleskey is ready to help take the Ducks far this season.